Nice day hike with Tina and Rich out of Mosquito Flat. Left Davis at 8pm the previous night, slept at the Mono Lake Visitor's Center for three hours and met the others at the trailhead at 5 (they had stayed in Bishop). Hike almost all the way to Morgan Pass, then left the trail and headed up to Cox Col (via Dade Lake). 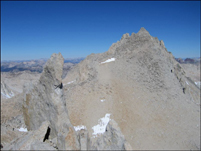 I summitted Pipsqueak first while waiting for T+R, then the three of us ascended Bear Creek Spire. Nice summit block and headwall with some class 4 climbing (quite fun at 13,700 feet). We then headed over to Pipsqueak Spire again, because I thought I could do Dade as well. Tina and Rich descended the col down to Dade Lake and then to Treasure Lakes, while I refilled the water bottle at the "crater lake" (so to speak) of Dade and then worked me way up the lose talus on its south side. I then descended via the hourglass and then down to Treasure Lakes, where I was in radio contact with Tina and Rich. I took off before them, sped home to Davis, because I had a BBQ to go to. I got there at 11:40pm. There was nothing left on the grill, but luckily the microwave guaranteed some warm meat for me.